Later revelation has a fuller understanding of the truth given in earlier stages, but the later unfolding cannot undo any previous presentation of the truth. In Bill Gates' annual newsletter, 2014 edition he addresses 3 myths about global poverty. All 3 sections are interesting; I have mixed thoughts about number 3, though noticed after I had read it that is was authored by Melinda Gates. 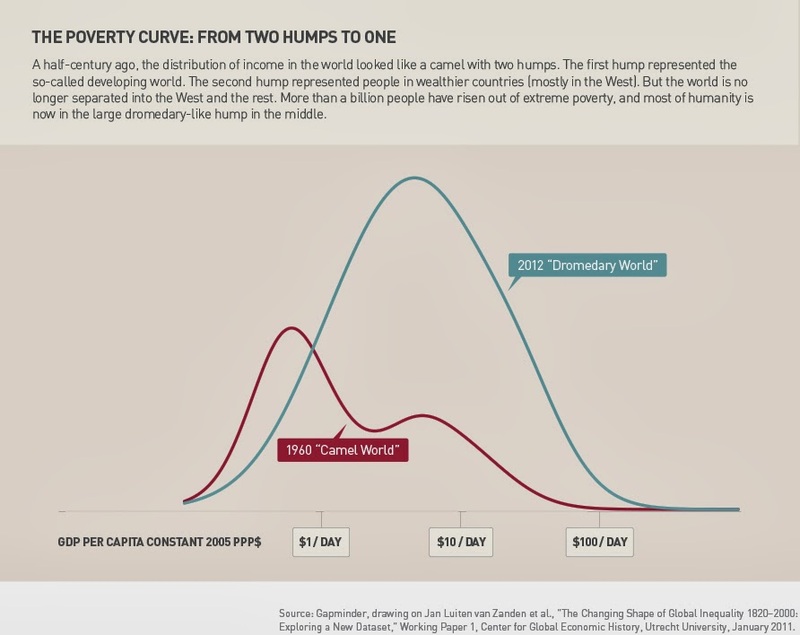 In the first section Gates has a graph on the change in individual wealth of the world over the last 50 years. Note that the x-axis is logarithmic. This comes about through productivity and trade. Wealth is created. Some of the big drivers of productivity include rule of law, private property, and low tax which suggests that had we seen optimum conditions in the last few decades we may have seen even better improvements. Still, this is encouraging. Gates mentions several other drivers such as health and education. Not mentioned (as a cause of productivity) is energy which allows significantly more output per person. The climate change paragraph can be ignored, developing nations need cheap and reliable energy, not low carbon energy. There is little doubt in my mind that Luke wrote the gospel attributed to him and there is strong early church evidence for this. The Acts of the Apostles was the sequel, so to speak. We can be confident that Luke wrote Luke and Acts, that he was a physician, and that he was a companion of Paul. Information about Luke beyond that is more speculative, though still possibly true. Below are some further possible claims about Luke based on close reading of Scripture, style of writing and reasonable assumptions. Many have made the claim that (one of) the anonymous author(s) of Hebrews is Luke, notably Allen in recent years in Lukan authorship of Hebrews. Allen makes the case reasonably well and also argues that Luke was Jewish, and that he was the amanuensis for the letters to Timothy and Titus. Luke is frequently thought to be a Gentile for several reasons including his excellent Greek and the exclusion of him from the men of the circumcision listed in Colossians—Aristarchus, Mark, and Justus. This is possible and would make him the only non-Jewish author of the New Testament (and the Bible, save possibly the book of Job). Others have made a good case for him being a Jew. Paul mentions the disciple who is well known for the gospel in his letter to the Corinthians. It is uncertain how "his praise is in the gospel" is to be understood so the NASB adds clarifying words and the ESV interprets this as preaching. Many have noted that Mark calls his work the gospel (whether intentionally as a title or not) and this could easily apply to Luke which (probably) postdates Matthew and Mark. So the reference to the praise/ fame of the gospel could refer to Luke's gospel as opposed to, say, Apollos' preaching. This would have ramifications in the dating of Luke (and Matthew and Mark). In Redating Matthew, Mark, and Luke, Wenham notes that Luke seems very familiar with much of the later detail of the Jesus' life and he follows Mark less in the latter aspect of the gospel. Further, Luke is the only writer to mention the sending out of the 70 and devotes more space to this than the sending out of the 12. From this Wenham speculates Luke may have been one of the 70 and much of the latter material of his gospel is first-hand knowledge. This possibility that Luke may have met Jesus in person could be strengthened by a further interesting point. Luke only identifies Cleopas (Luke 24:18) of the 2 men on the road to Emmaus. This may be because Cleopas asked a question. Wenham speculates that the other man was in fact Luke. It seems less likely that all these suggestions are simultaneously true. The author of Hebrews mentions that he was a second generation believer. Nevertheless, these possible identities are worth pondering. My parents taught us that ingenuity was never to be expended on the text, making it tell you things you would rather hear. But rather, once you had let the Scriptures speak to you, straight up, ingenuity was fine in looking for creative and effective places to obey. Use your wits to apply the text, not to evade the text. The theme of spiritual gifts is frequently noted in 1 Corinthians 12. The types of gifts and their hierarchy are noted. Yet Paul refutes any idea that those with prominent gifts are more valuable in God's sight. It can be seen that God gives gifts as he sees fit. However what struck me some time back was the apologetic against polytheism. Now concerning spiritual gifts [things], brothers, I do not want you to be uninformed. You know that when you were pagans [Gentiles] you were led astray to mute idols, however you were led. Therefore I want you to understand that no one speaking in the Spirit of God ever says "Jesus is accursed!" and no one can say "Jesus is Lord" except in the Holy Spirit. Here Paul addresses a question from the Corinthians. They had probably asked about spiritual issues and Paul states, "Concerning [the] spiritual" and then he reminds them of their previous life as idolaters. Paul is contrasting the Spirit they received with the spiritual realm they previously were a part of. While within paganism their are many demons (1 Corinthians 10) there is one Holy Spirit. And it is the fact there is one Spirit and not several which shapes he subsequent response. To another the working of miracles, to another prophecy, to another the ability to distinguish between spirits, to another various kinds of tongues, to another the interpretation of tongues. All these are empowered by one and the same Spirit. Note also the Trinitarian allusion in verses 4–6: same Spirit, same Lord, same God. in one Spirit we were all baptized into one body—Jews or Greeks, slaves or free—and all were made to drink of one Spirit. Sure, we can learn about the types of gifts but this seems secondary to the emphasis on the Spirit being one. Paganism may acknowledge and worship many spirits but for Christians there is only one and the same Spirit. The Holy Spirit may manifest in a variety of ways, but he always testifies to Jesus and can never deny him. A rational assent to the truth of the Bible is one ingredient in the Christian faith. John Wesley (1703–1791), Reason for the Hope Within. Christian theologian Guillaume Bignon writes of his conversion, "How God turns a French atheist into a Christian theologian." He tells of how he became an atheist at a young age then his honest investigation into Christianity several years later. Encouraging testimony, enjoyable read. Norman L. Geisler reviews Five Views on Biblical Inerrancy. The review is very long, but worth a read if you have interest in the debates around inerrancy. He covers several different issues: textual concerns, choice of authors, (lack of) positions of writers, trajectory of errancy advocacy, historical view of inerrancy, and removing people from societies. While broad, these issues apparently appear in the book in various parts. He also rightly insists of distinguishing accuracy from precision, something I think is not emphasised enough. Inaccuracy is error, imprecision is not. The doctrine of inerrancy is sometimes criticized for holding that the Bible always speaks with scientific precision and historical exactness. But since the biblical phenomena do not support this, the doctrine of inerrancy is rejected. However, this is a “straw man” argument. For the CSBI states clearly: “We further deny that inerrancy is negated by biblical phenomena such as a lack of modern technical precision…, including ‘round numbers’ and ‘free citations’” (CSBI. Art. 13). Vanhoozer notes that Warfield and Hodge (in Inspiration, 42) helpfully distinguished “accuracy” (which the Bible has) from “exactness of statement” (which the Bible does not always have) (Vanhoozer, 221).